This new film series shows the two rappers in conversation about the future of art. 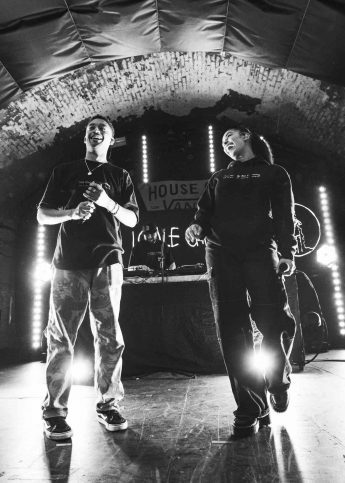 If you’ve found yourself lately all kinds of obsessed with South London rap maverick Loyle Carner’s signature brand of poetic hip hop, get to the back of the line. And another wordsmith who’s been creeping his way up the ranks with his similarly therapeutic spit? East Londoner Barney Artist. So if your obsession level wasn’t already at peak boiling point, the Tate Collective have brought the young tastemakers together in conversation for a new film series, Artist Meets. The charismatic duo have a frank conversation about how they met, how and why they got into music, the impact of art on young people, and Loyle’s plans later to make a Penang curry (where’s our invite?). Directed by British-Algerian filmmaker Nadira Amrani, Loyle x Barney is the first of four videos which will see a Tate Collective collaborator chatting to someone they’ve pegged as an up-and-comer they admire.